Bansalan is in the province of Davao del Sur and accessible by land from all points in Mindanao. Air travelers should pass through the Davao International Airport in Davao City, an hour drive away from the capital city of Digos. From Digos City, you will have to travel another 20 minutes, before reaching the municipality. Alternatively, you can take the bus in Davao City Integrated Bus Terminal in Ecoland. Metro Shuttle Buses bound for Bansalan should be available. While Weena, Grand and Tacurong buses bound for Cotabato Kidapawan and Tacurong have stop-overs in Bansalan. Bansalan has arguably the most beautiful Catholic parish church in Davao del Sur. From a wooden church building, an impressive structure was erected patterned after Canadian architectural design. Rev. Fr. Germaine Pelletier, PME was the parish priest who saw to its completion. Fr. Pelletier was a Canadian missionary from Quebec, Canada. Although he was a French-Canadian, he was also fluent with the local dialect which is predominantly Cebuano. 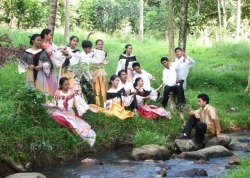 The PME missionaries used to serve the parishes of Davao del Sur. Also mentioned as an attraction in Bansalan under the "Man Made" category is the Mindanao Baptist Rural Life Center. This conservation area in Kinuskusan, Bansalan is famous for its Sloping Agricultural Land Technology (SALT). Mount Apo is a large stratovolcano on the island of Mindanao in the Philippines. It is the highest mountain in the country and overlooks Davao City, a few kilometres to the northeast. Its name means "master" or "grandfather". Apo is flat topped, with three peaks, and is capped by a 500 m wide volcanic crater containing a small crater lake. It is a source of geothermal energy, but the date of its most recent eruption is unknown, and none are verified in historic times. Mount Apo is one of the most popular climbing destinations in the Philippines, and the summit is easy to reach. It was first climbed on October 10, 1880 by a party led by Don Joaquin Rajal. Last February 2008, The Mt. Apo - Bansalan Trail was formaly opened to the public.